Uber CEO Travis Kalanick's recent resignation over inappropriate remarks about women raises questions of gender diversity and success in tech startups. A culture of gender diversity and its importance to a company’s success cannot be overstated. A 2013 study by the Harvard Business Review has shown that firms with greater diversity out-perform their non-diverse counterparts, both in developing innovations and in market access and growth. One such industry where the benefits of gender diversity are cropping up is the agriculture sector. Currently, there are nearly one million women in the US farming industry, representing 30% of the sector and globally they represent 43% of the agricultural labor force. That number is growing. Women are increasingly present in leading roles in ag-tech startups. Larta Institute sees this increasing gender diversity at our annual Ag Innovation Showcase. Since its inception in 2009, the Ag Innovation Showcase has presented high-impact innovations from around the world, stimulating discussions about the future of Ag, and created opportunities for effective networking. The graph below depicts the number of women-led companies, defined as having a female Founder, CEO, or in the C-Suite, that have participated as presenting innovators at the Ag Innovation Showcase. 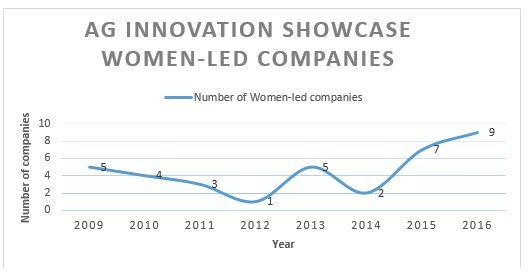 The showcase, which chooses its companies in a blind application process, has grown from featuring a modest number of five female led-companies in 2009 to seeing women-led companies as a major force at the Showcase, with nearly half of all participating companies being women-led in 2016. Why is gender diversity so important for startups? There are a number of reasons, but at the core is the idea that diversity improves a company’s ability to think creatively for solutions. Who better to innovate than the people traditionally underrepresented in a particular field or industry? A diverse team that includes voices that have been missing from the conversation in the industry, board room, or other decision-making roles, are actually be a key ingredient to business success. These people bring different strengths and skillsets, as well as a different understanding of the target audience. Neogram has created GRAMAX, a new high-quality pasture. Its higher digestibility increases the conversion efficiency from grass into meat or milk, generating two positive impacts: Increased grass to meat ratio and reduced methane emissions. Whole Trees engineers and manufactures lumber waste product into beautiful structural systems for residential and commercial buildings. Using the latest digital tools, Whole Trees is decoding trees’ strength which makes it 50% stronger than milled wood. Ignitia has developed both the technology and distribution channels to deliver reliable tropical weather forecasts through SMS for small holder farmers in Africa, increasing yield. XTB Laboratories, Inc. provides technology to agricultural organizations for early detection and rapid response to critical disease infestations, such as citrus greening. Their technology “smells” the disease before the symptoms begin to show and allows farmer to remove diseases trees and plants from the field. I look forward to seeing increasingly diverse companies at our Ag Innovation Showcase events.